Amazing mediaAvatar iPad PDF Transfer for Mac is designed for eBook fanciers on Mac who prefer to read eBooks on their iPad. mediaAvatar iPad PDF Transfer for Mac enables the possibility to transfer PDF/EPUB eBooks between iPad and Mac as well as backup PDF/EPUB files in iTunes. Transfer adorable eBooks to iPhone/iPod touch on Mac and read them anytime and anywhere. Backup PDF/EPUB files in your iPhone/iPod touch to Mac or iTunes as well. Download mediaAvatar iPad PDF Transfer for Mac for free now and experience the amazingly fast PDF/EPUB eBooks transferring between iPad/iPod touch/iPhone, Mac and iTunes! Backup all PDF/EPUB eBooks in your iPad to Mac at fastest speed possible and fine-quality. Transfer PDF/EPUB eBooks stored on your Mac to iPad in a single step: just drag and drop target files to this iPad PDF transfer software. Backup all your iPad PDF/EPUB eBooks to iTunes in the easiest and securest way. 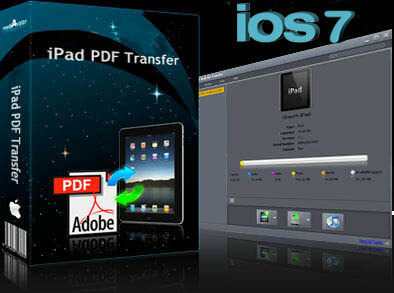 Not only transfer iPad PDF, but also transfer PDF to iPod touch/iPhone and backup iPod touch/iPhone PDF to Mac or iTunes. iPad, iPad 2, iPad 4, iPad mini, iPod touch 2, iPod touch3, iPhone 3G, iPhone 3GS, iPhone 4, iPhone 5 are all supported. Great performance in transferring eBooks between iPad/iPod touch/iPhone, Mac and iTunes. Display detailed information of connected iPad/iPod touch/iPhone automatically, like type, capacity, version number, serial number and format. You are enabled to edit the profile of eBooks like name and author. You can also rate the eBooks or comment on them. With a convenient file search filter equipped, mediaAvatar iPad PDF Transfer for Mac enables you to search files by name, type, author and publish date in an instant. Allows you to transfer a batch of PDF/EPUB eBooks simultaneously. Available in languages of English, French, Italian, Spanish and German.